I found these vintage inspired paper mache masks at Target and my only regret is that I didn’t buy every last mask. Alas, they’re sold out locally and I’m kicking myself for not getting more. If your local Target is sold out don't fret, you can find similar masks made of fabric and paper at craft chains and costume supply stores. It’s so easy to dress them up with inexpensive glitter, gems, feathers and decoupage using Aleene’s Tacky Glue, Fabric Fusion tape and decoupage medium. 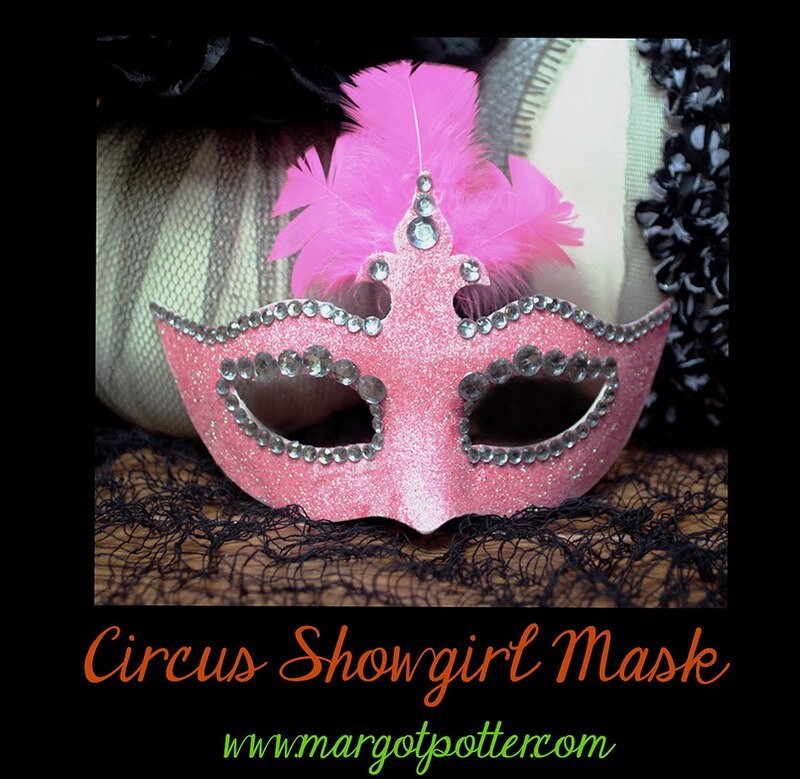 These also look fabulous painted or covered with sequins or ribbon, so make them your own. I love them for Halloween, but they’re so fun you could use them for Home Décor year round! 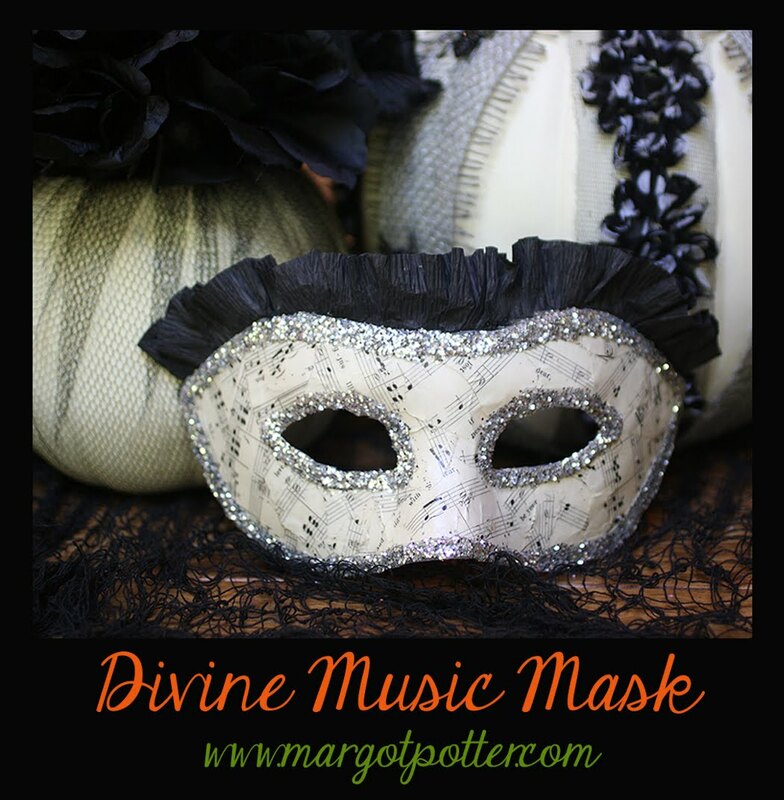 You can give these masks even more vintage appeal if you remove the stretchy straps and attach a painted dowel and satin or lace ribbons. Watch the video on Knoxville's WBIR Channel 10 Live at Five at Four here! Cover mask with a thick layer of Tacky Glue using a sponge pouncer. 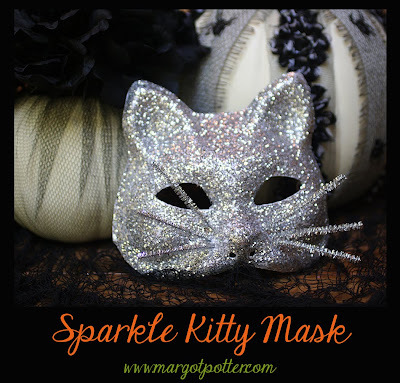 Working over a paper plate or cardboard folder, douse mask with chunky glitter. Tap off excess. Dump unused glitter back into jar. Allow to dry. When mask is dry, use an awl or a drill to create three holes on both sides of nose. Cut each wire tinsel stem in half, turn a small loop in the end and thread into hole, dabbing back of hole with Tacky Glue to secure whiskers. Allow to dry. Purrrfection! 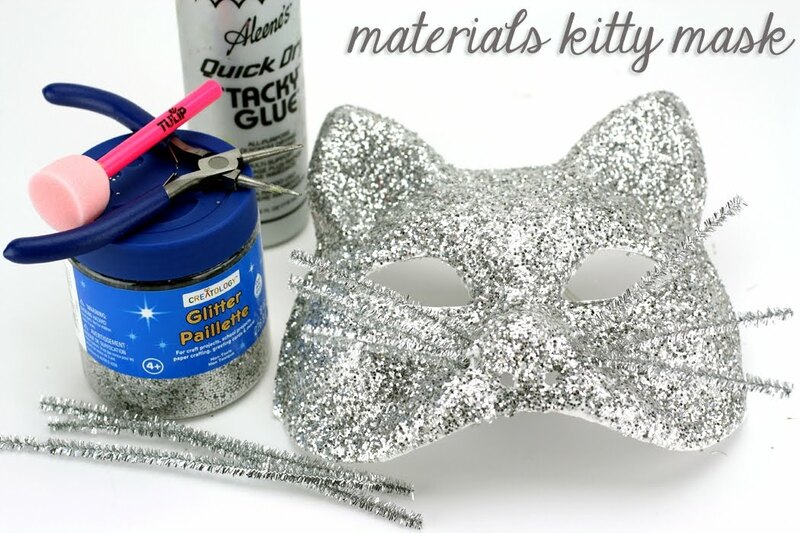 Cover mask with a thick layer of Tacky Glue using a sponge pouncer. 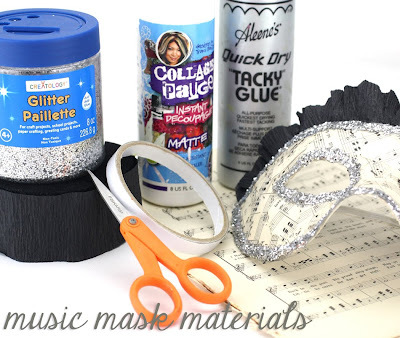 Working over a paper plate or cardboard folder, douse mask with fine fabric glitter. Tap off excess. Dump unused glitter back into jar. Allow to dry. When mask is dry add faux rhinestones. Squeeze out a small amount of glue on a paper plate. 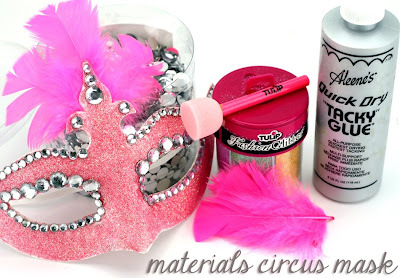 Dip each crystal in glue and add varied sizes around eyes and top of mask. Glue three features to back top of mask. Allow to dry. Now you’re ready for the center ring! Working in small sections, tear pieces of sheet music and adhere them on to surface of mask using decoupage medium Brush medium on mask, add paper, add more medium. Old paper tears easily and works very well for this technique. (Old book pages or sheet music will work, if you’re thinking of using new paper try printed tissue or stamping text on plain tissue.) Allow decoupage medium to dry completely. Squeeze a bead of glue around edges of mask and eye holes. Work in sections. 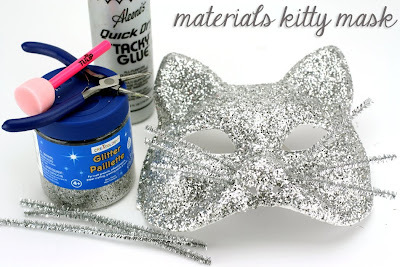 Sprinkle chunky silver glitter over glue and tap off excess working over a paper plate or cardboard folder. When all glue is covered, dump unused glitter back into jar. Allow to dry. Attach a Fabric Fusion tape strip across the top at the back of your mask, peel off top of strip to expose adhesive. Working from your crepe paper spool, adhere paper making small folds as you move across tape. See photo for details. When you reach the end of the mask, cut off excess paper on both sides. I feel a song coming on!